Let’s be honest: if you’re a content marketer, you don’t spend most of your time writing. Yes, you might be consumed with a new article or blog post here or there, but in order to write that piece of content you have to become an expert at whatever topic is at hand. Then you have to promote it, repurpose it, and even pitch it out to external outlets. Before I jump into how I blatantly abuse Mozbar, let’s consider what Mozbar was originally intended for. Mozbar is largely used for website analytics and SEO. Let’s look at Capterra as an example, where I write about project management. We all know what metadata is and that social shares are a simple measure to test engagement and build SEO, but what about everything else? Go ahead and skip down to Mozbar hacks if you already know the difference. If not, or if you just need a quick refresher, read on. Page authority, or PA, is unique to Moz. It’s an estimation, graded on a logarithmic scale of 0 to 100, of how well a page (in our case, an article) will rank on Google. The higher the number the better. Domain authority (DA) is more of a bird’s-eye-view of the entire website hosting the article–in the case of the blog post I listed above, the domain authority is looking at Capterra.com, not http://blog.capterra.com/free-open-source-project-management-software/. Like PA, domain authority is scaled from 0 to 100, and it gets more difficult to move toward 100 as your site gets better recognition. Most importantly, use page authority to look at individual articles, and domain authority to look at the overarching site. Therefore, when looking at competitors’ SEO, look at their domain authority. When competing with them on specific keywords in blog posts, look at page authority. Good. Because you’ll need that information for the next two sections. 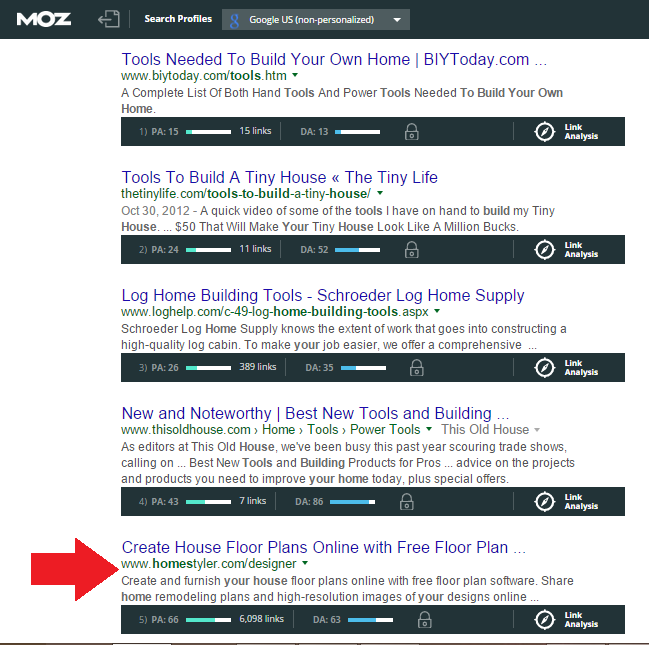 Clearly, Mozbar is meant to be used mostly as an SEO tool. I’ve certainly used it this way, but I’ve found it’s most effective when being used as a research tool. No one can overstate the importance of evergreen content. Mozbar helps you make the most of it. In this example, I’m pairing it with a paid version of Google’s Keyword Planner, but that can easily be replaced with the free keywordtool.io platform. Right now I’m brainstorming for a new post for Capterra. I’d like to write something evergreen and something that can be repurposed for guest blogging (which I’ll get to in a second). Remember: Capterra’s Moz DA is 68. The first thing I do is jump over to keywordtool.io to look up some long-tail keywords. In this example, I’m going to be writing on construction management software. Use Keywordtool.io before breaking into Mozbar hacks. Huh, looks like “construction management software for Mac” is doing pretty well, and that’s a nice long keyword sure to drive leads. I’m going to hop over to Google analytics to see if I stand a chance to make the front page blogging about this particular topic. 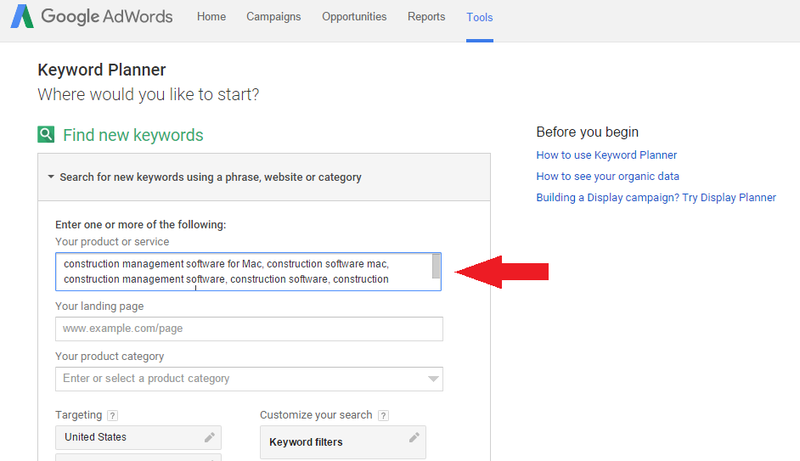 I’m also plugging in similar keywords in case “construction management software for Mac” doesn’t work out. In fact, I ended up plugging in five keywords just in case. I then looked at Google’s suggestions and how each of those keywords rank. I promise we’ll be getting to the Mozbar hacks in a second. Look for low competition and high searches. All I can say about these findings are “ew.” If this is what comes back to you, reject it and try a new keyword. I’d certainly be able to get onto the front page, but it wouldn’t be worth it. You want low competition for a high number of monthly searches–there’s no reason to compete against high-performing keywords with only 20 searches per month. So I went back to the drawing board and got a bit more niche in my industry. Eventually, I settled on a keyword from Google’s suggestions. Cool. Lots of traffic. Low competition. But I haven’t fully settled on whether or not I’m going to write this piece. I mean I do want to make sure it ends up on the front page of Google–there’s not reason to waste my time. Don’t worry, Mozbar is coming soon. First, go to Google’s homepage. Not a new tab, but actually Google.com. In the bottom right-hand corner, click settings, then search settings. From there, select “never show instant results,” and amp up your Google homepage results to 100. This tells Google that you want 100 results per page that are not dependent on who is searching for what at that singular moment. In other words, Google is going to be prioritizing evergreen content over new content. 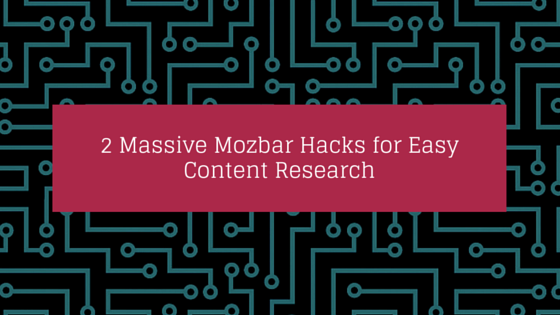 From there, Mozbar kicks in as an amazing research tool. Readers are most interested in a step-by-step of building their own house and how much it will cost them, monetarily, to do so. With those two reader interests in mind, there isn’t a whole lot about how software can help them. They’re probably not searching for construction management software solutions, so it will have to be subtly woven into the text instead of a typical list of home building software reviews. Capterra, with its 68 domain authority rank, can compete with a majority of these sites for a top-10 spot (and even, hopefully, a top-3 spot). So I set out to find the best tools to build a house. I decide to title my post, “How to Build a House Using These [Number] Tools” and set off to find out which tools a potential home builder will need. I come back to Mozbar again. 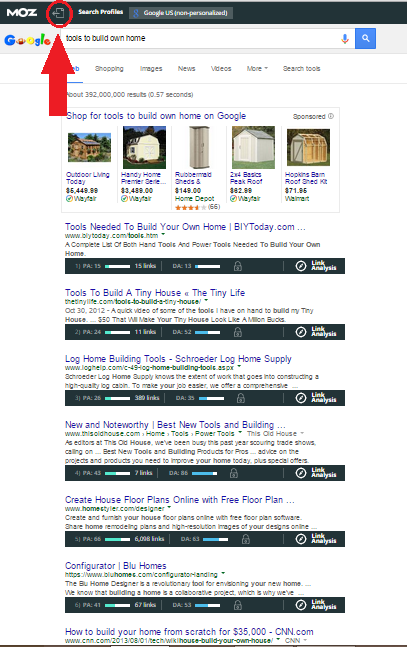 I’ve typed in “tools to build own home.” Remember, I’m not targeting this specific keyword because “how to build a home” has more monthly traffic. At this point software is beginning to show up. Cool! I continue to scroll down and realize this is exactly the kind of research I need. What I do is I take a relevant search and plug it into Google. Then I get Mozbar to export the data to a CSV by clicking the little icon on the left-hand side. By now, all 100 front-page results are exported into a handy Excel spreadsheet. This is immediately what I see. I decide to trim it up a bit and make it just a little easier to read. I only keep columns B, C, and D; URL, Title, and Description. I shrink down URL so it doesn’t take up space and amp up the area for Titles and Descriptions so that I can easily skim the page. What makes a good Mozbar link? I’ve highlighted a few things to look out for. Firstly, numbers 5, 6, and 9 all look like fantastic resources because of their quick metadata descriptions. Log Home Building Tools is likely a bit off-topic, but could be worth checking out. Row 8 has no metadata, so I’m going to skip it. And then there’s row 11. Row 11 has the potential to be great because of its title, but looking closely at the metadata reveals that this post will not help me with my research. I scrap it all together. Now let’s recap for a second. Mozbar has found me the best resources on a given topic in a matter of seconds, and has made all that research entirely skimmable on Excel. How cool is that? In fact, using this technique is great for building list posts (for example, I used it for “88 Construction Management Twitter Accounts You Need to Follow“) using the process detailed in Boost Blog Traffic. Research for your article: done. Let’s move on to repurposing. Don’t believe the hype: one of the best ways to raise your company’s domain authority is with links from other sites linking back to your blog. Let’s be clear: I’m talking about sites with high domain authority themselves that are not publishing duplicate content. I’m talking about guest posts with one, one, targeted link back to your site. And we’re going to figure out exactly who to write for using Mozbar. This time, I’m going to focus on project management software and pop culture–I have a series of posts linking project management to action-adventure movies, and since they tend to get a lot of attention, I’m going to pitch one out as a guest post. Last year, I wrote a blog post called “8 Project Management Lessons From The Hunger Games: Mockingjay Part 1.” Part 2 is coming out late this fall, so I have plenty of time to repurpose this piece and update it for the new movie. So I head over to Mozbar and Google again and see who’s writing on similar topics. I type in “Project Management Movies” and see what I get. Holy guacamole, looks like I wasn’t the first person to have this idea! Let’s see who is worth pitching here. Amazingly, LiquidPlanner, a project management company, has a very high ranking for their post, and they’re even worth pitching. Check! I’ll definitely pitch to them. Quora is a lot like Yahoo Answers. It’d be great to post links back to my topics on this question, but let’s focus on pitches first. Intuit. Into-it. This looks like a great blog to pitch, and hey, Capterra has a great relationship with them too. Cha-ching! Plus, you’ll notice that their domain authority is higher than Capterra’s 68, so a link back from them would mean an increase in SEO for us on whichever page we link back to. I ended up knocking off PMI.org, even though their domain authority is high. Why? Their article is from 2007 and behind a registration wall, and it looks like all of PMI’s blogs were moved to Voices. No thanks. Finally, we have io9. What a hard hitter! This publication is so well known that I might call up a PR agency to help me get in touch with the right person. Knowing that they’ve published this kind of content makes it more likely that they’ll accept similar articles in the future. Now that would be a high-quality linkback. Whew, these two Mozbar hacks are really quick to use in practice, but take a little time to explain on the first get-go. With that being said, I’m sure these two techniques will really help you optimize your use of this great tool. With that being said, I’m sure that there are ways to use Mozbar that I haven’t thought of. What are they? How do you use Mozbar? I would definitely love to learn more creative ways to use this tool that are just quietly under my radar. For those of you interested in getting my posts regularly, consider signing up for my email list. If not, I’ll be sure to see you next time!